Recognized as the “white Pinotage” this exciting and fruity wine showcases the versatility of Pinotage. When blended with Chenin Blanc the result is a unique tasting, easy sipping white wine. Good primary fruit giving way to hints of mineral, earthy and mixed tropical fruits. A long lingering finish with resonating fruit, acidity and mineral aftertaste. Enjoyable as a crisp summer drink on its own or a perfect companion to light summer dishes and seafood. The Pinotage grapes were picked at an early stage to ensure an abundance of sweet red berries aromas. After crushing the grapes the juice was immediately drained and separated from the skins to give the wine its white colour. The juice was fermented for 21 days at 11.5°C. 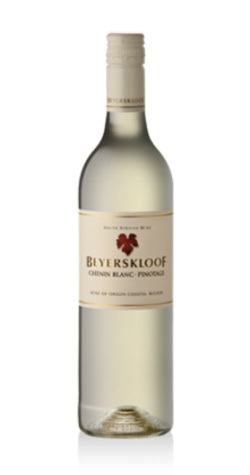 After fermentation, a fuller bodied and more structured Chenin Blanc was sourced and blended with the Pinotage. The Beyerskloof winery, the quintessential king of Pinotage and a charming family-run farm lies in the Cape Winelands of South Africa, overlooking Stellenbosch's grand Simonsberg mountain and producing fine and exceptional wines.